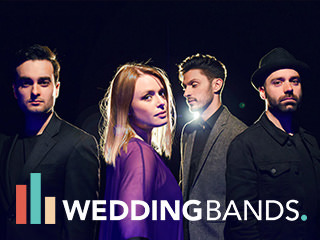 What better backdrop than the great outdoors in which to say your vows? 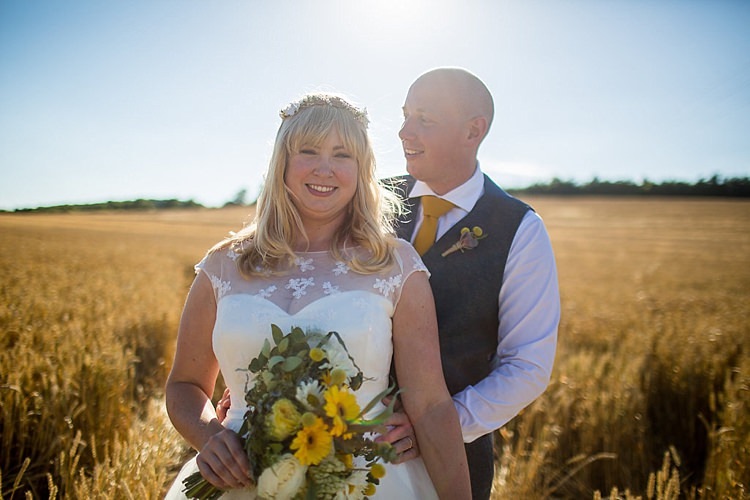 Today’s newly-weds love being outside and with an array of nature loving hobbies, the only way to truly represent themselves was to host a country celebration in Bedfordshire. 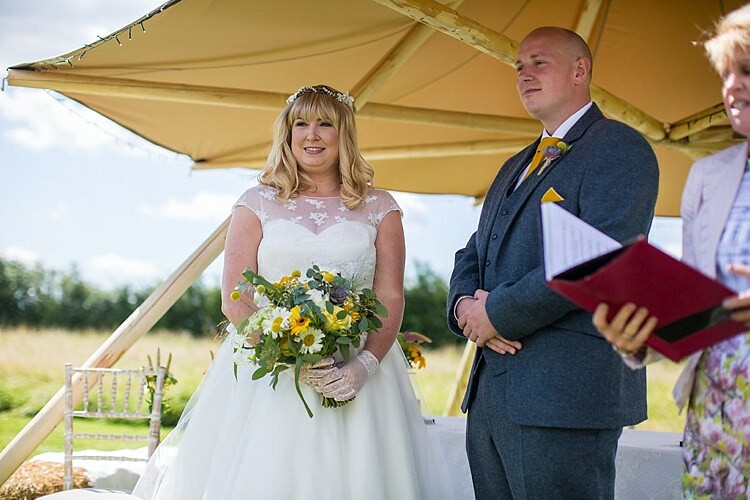 WWW readers Kendra and Paul tied the knot in the Meadow at Charity Farm on the 6th August 2016. 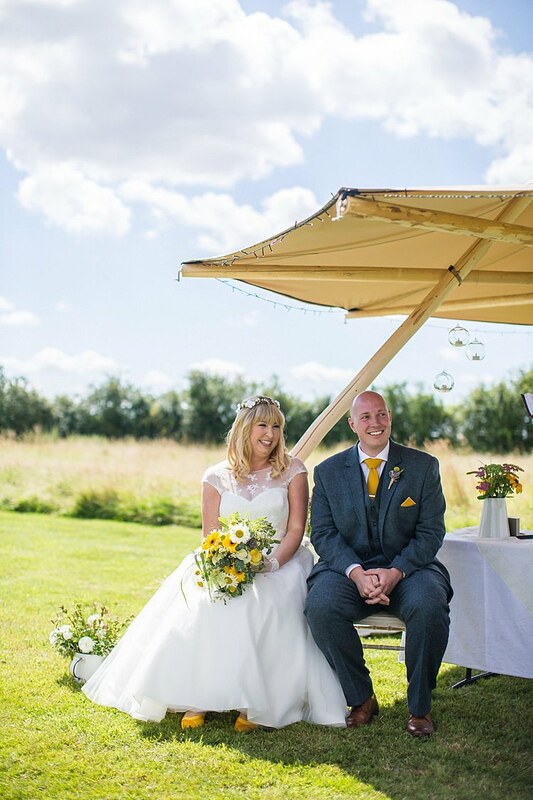 They chose a vibrant and fun yellow colour scheme, which was so joyful and pretty, especially working well being in the summer months. 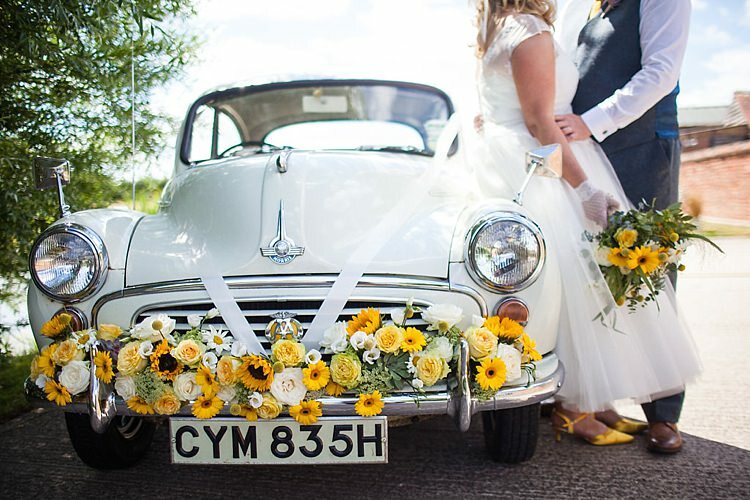 There was also a nod to their love of vintage, with the amazing Morris Minor owned by Kendra’s grandmother covered in yellow blooms, a 1950s style frock just perfect for twirling and prom dresses for the maids with the boys in bow ties and braces. 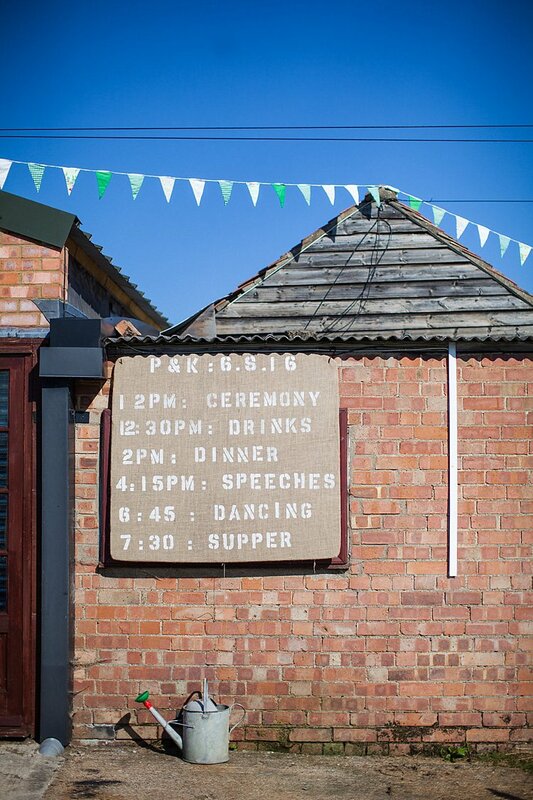 Their DIY efforts were really very astonishing, from oodles of fun signage dotted around the venue to the reams of bunting and the luggage tag seating plan. 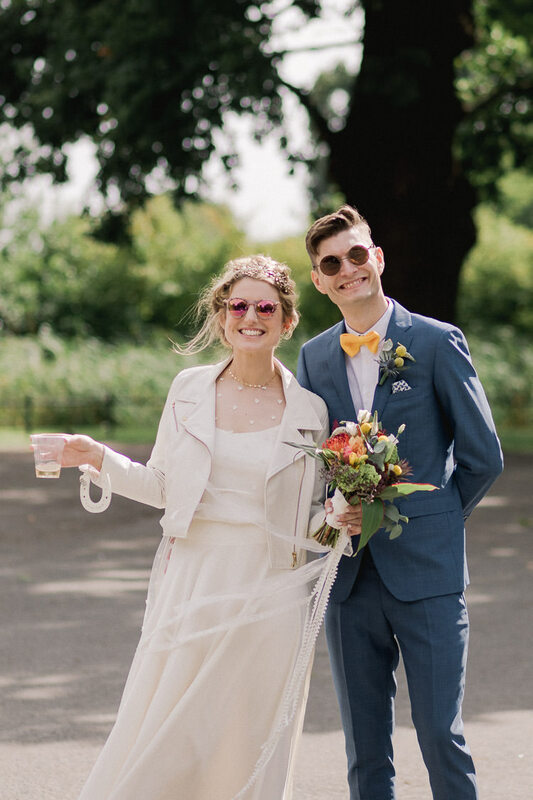 There were such lovely vibes throughout and I just know you are going to love these sunny photographs. 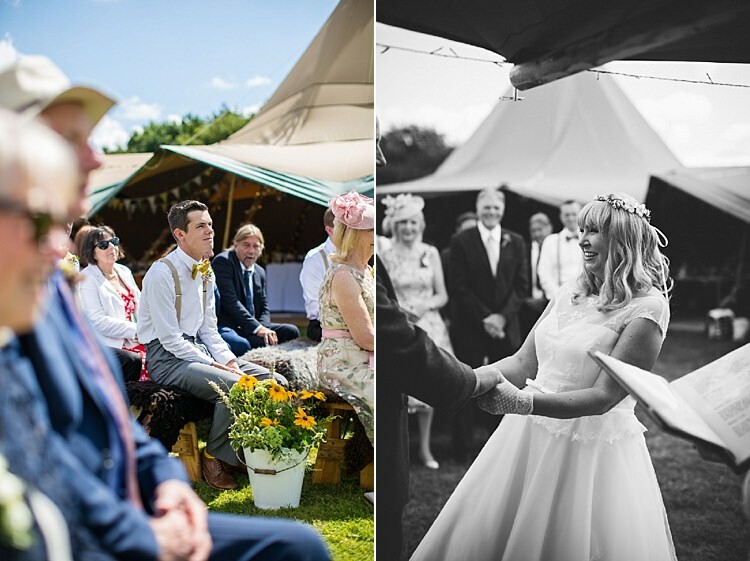 Thanks so very much to Sally Forder at Binky Nixon Photography for sharing these divine shots. 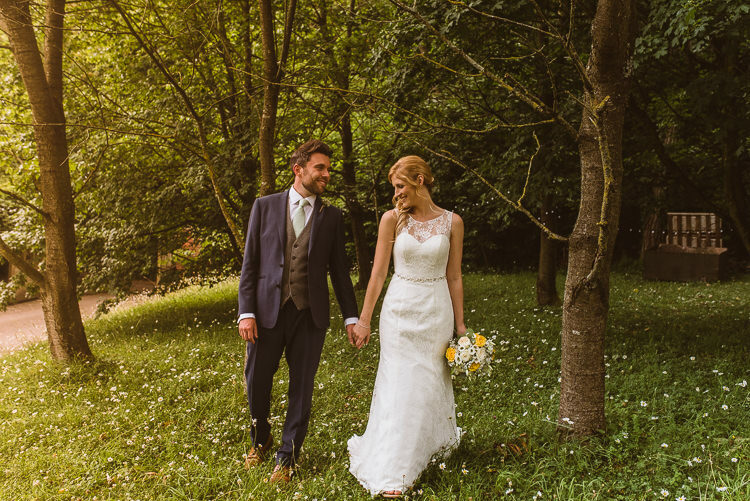 THE VISION | We love being outside… walking, gardening, playing cricket, keeping bees, so the outdoors had to be incorporated into our big day as much as possible. 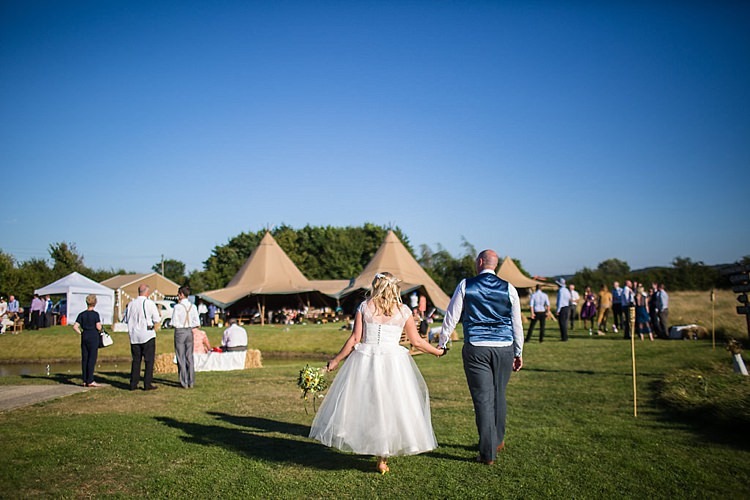 After a lot of searching the internet for inspiration (including this very website), we fell in love with the idea of tipis, and I knew just where to put them… in my parent’s field next to my family home. 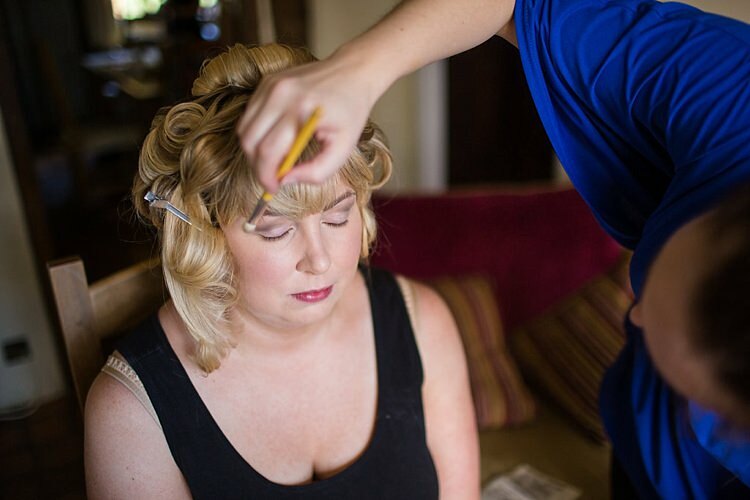 Having always been a bit of a tomboy I didn’t want an overly girly theme, and so the wedding evolved combining all the elements that were meaningful to us. 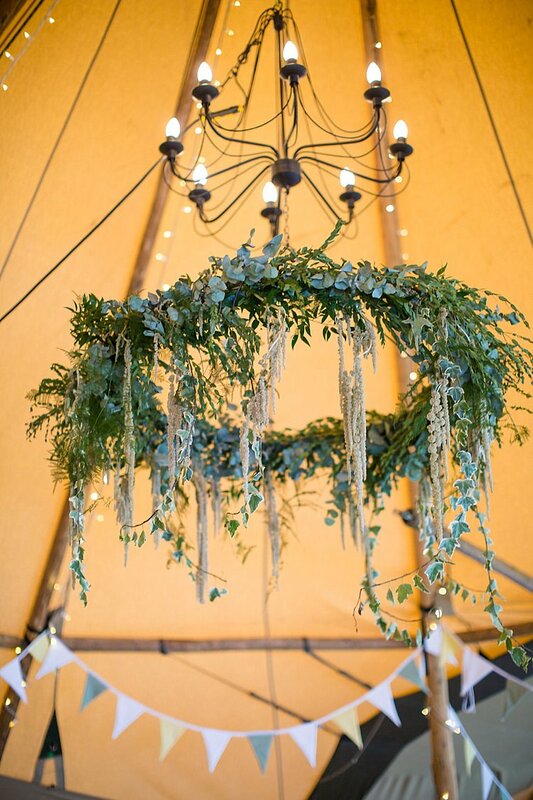 We wanted to create a relaxed festival atmosphere, that was elegant, but still had a nod to times gone by. 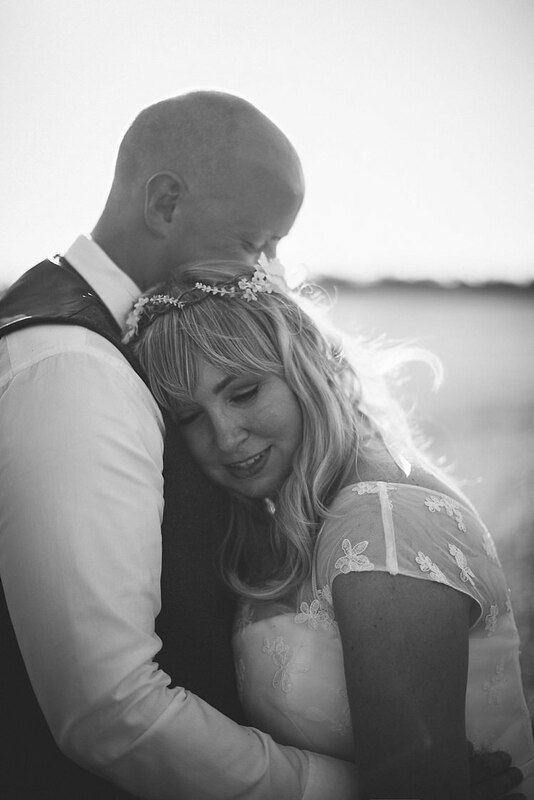 THE PLANNING PROCESS | It all started with working out how we could have our wedding ceremony in a field… but with Charity Farm being an unlicensed venue we decided to get married the day before at a local registry office, and then have a celebrant perform a ceremony in the field on the big day. That way we could have the ceremony we had dreamed of, and more importantly our guests could arrive and relax knowing that they didn’t need to move venues on the day. 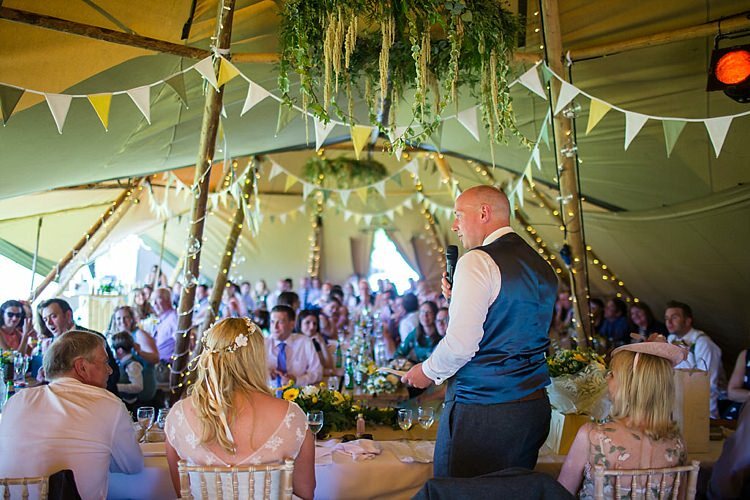 Once the registry office was booked it was just a case of moving through the list, booking tipis, caterers, florists… a bit like a jigsaw puzzle, it was a matter of booking in the big things, and then filling in all the little bits and bobs. 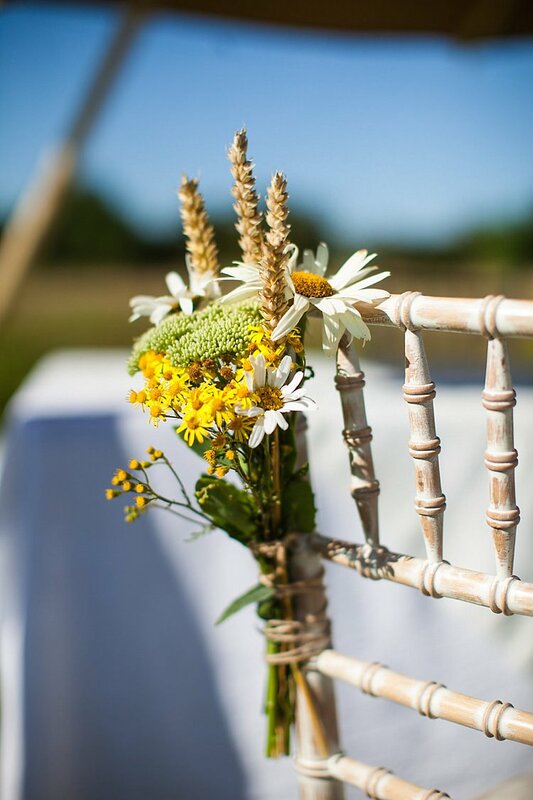 THE VENUE | The Meadow at Charity Farm, Bedfordshire. The farm’s field was left to grow natural long grasses, which just looked dreamy in the August sunshine. 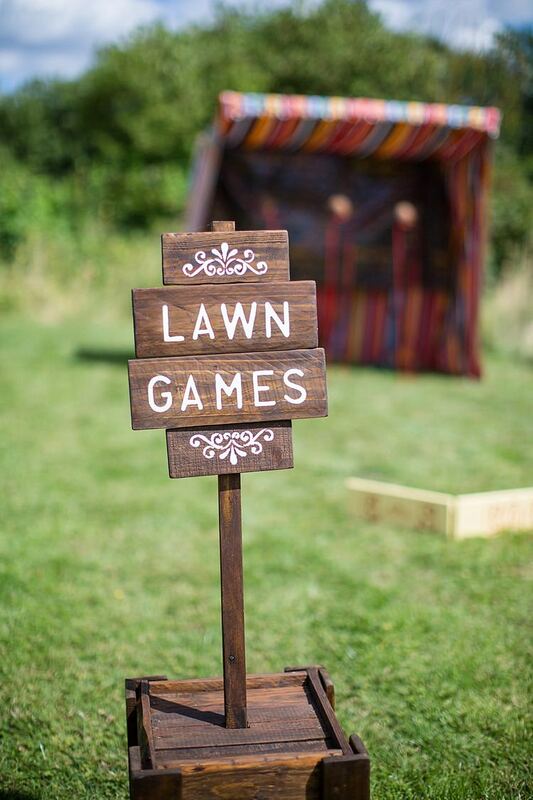 Paths had been mown into the long grass which the guests could amble around, perfect for strolling tired little babies. 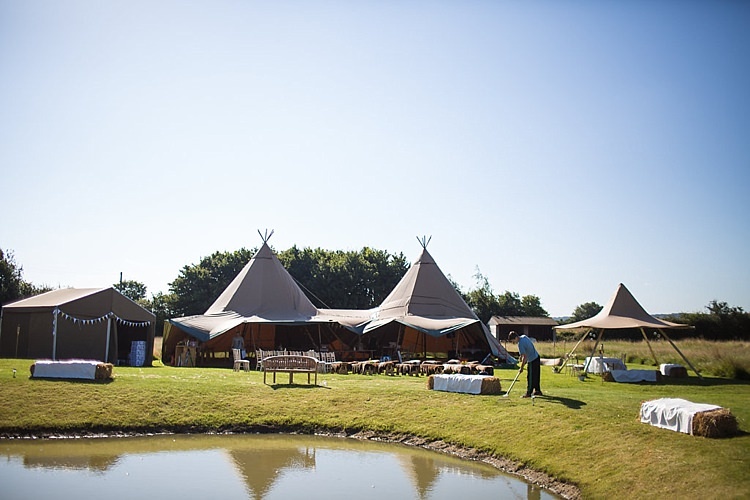 The tipis were placed next to a large pond, which was speckled with floating tea lights. The feedback about the venue was fabulous! Our guests couldn’t believe this was the field next to our family home. 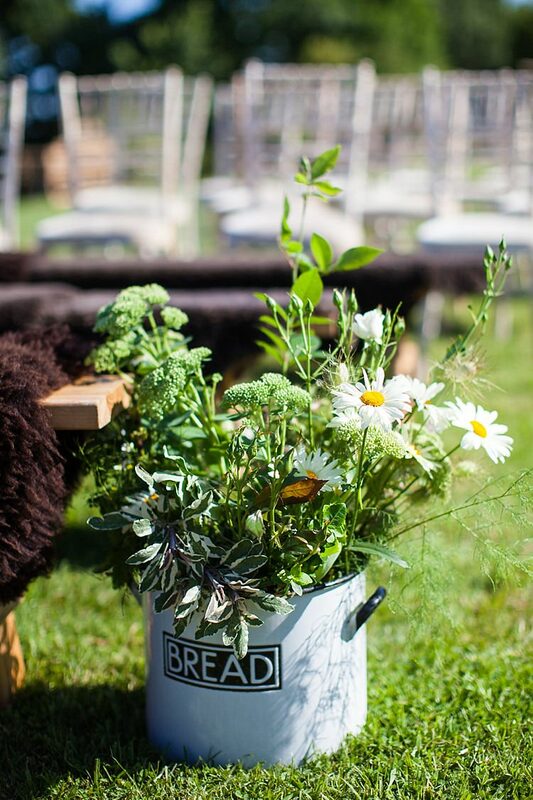 “The Meadow” at Charity Farm is now available for wedding hire. 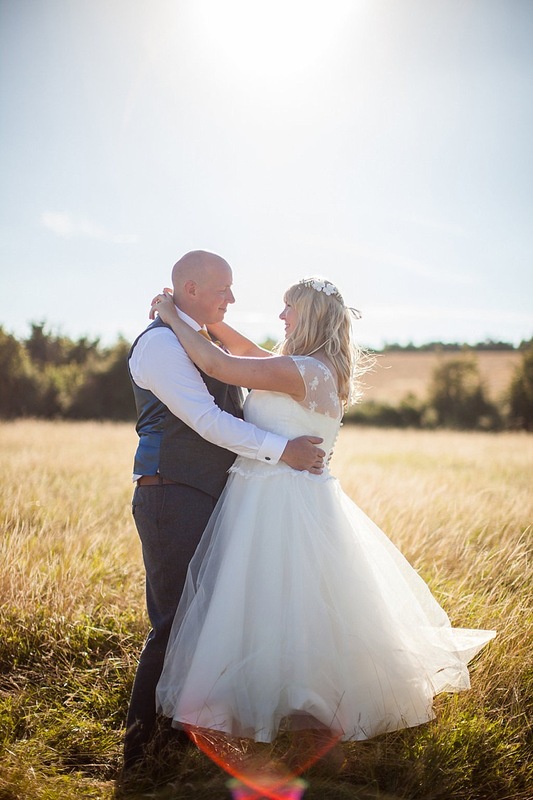 THE DRESS & ACCESSORIES | My dress was called Madeleine by LouLou Bridal. 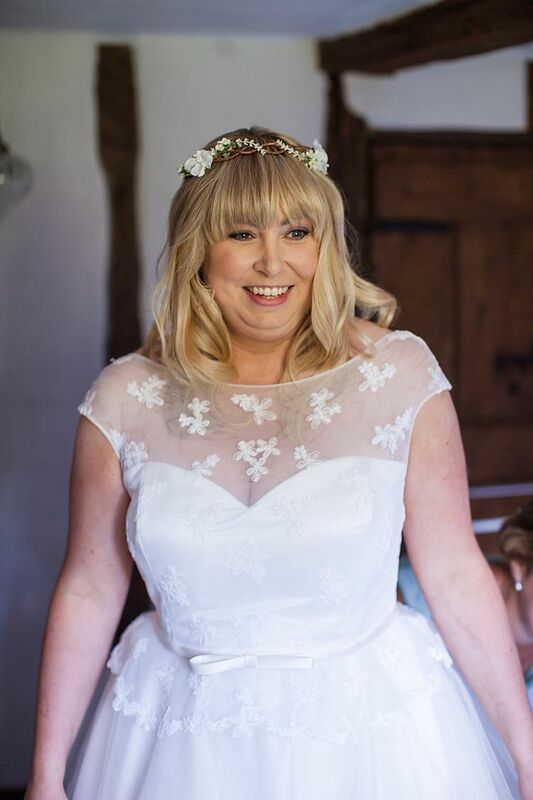 Loulou have the most amazing range of 50s and vintage inspired wedding dresses, very flattering for more curvaceous ladies as they really cinch in your waistline. 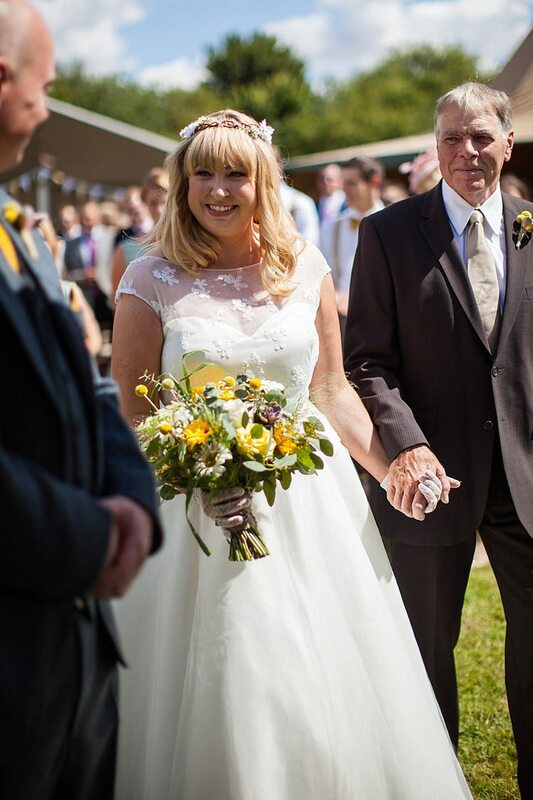 I accessorised my dress with short lace gloves, a floral headband from Etsy, and some satin court shoes from Rainbow Club, which I had dyed bright yellow to match the ushers’ socks. My pearl earrings were borrowed from my mum, and were actually a gift from her mother. My sister tied an old sapphire ring to my bouquet, so I had something old, blue, and borrowed. I had plenty of new things, so all bases were covered! Although I generally went for a 50s theme, there was still a relaxed feel to my look. FINDING THE DRESS | London is where I began the search for my perfect dress. There are a vast number of designers and you can try on lots of different styles at different prices at a huge range of shops, until you find one that really makes you feel the very best version of yourself. 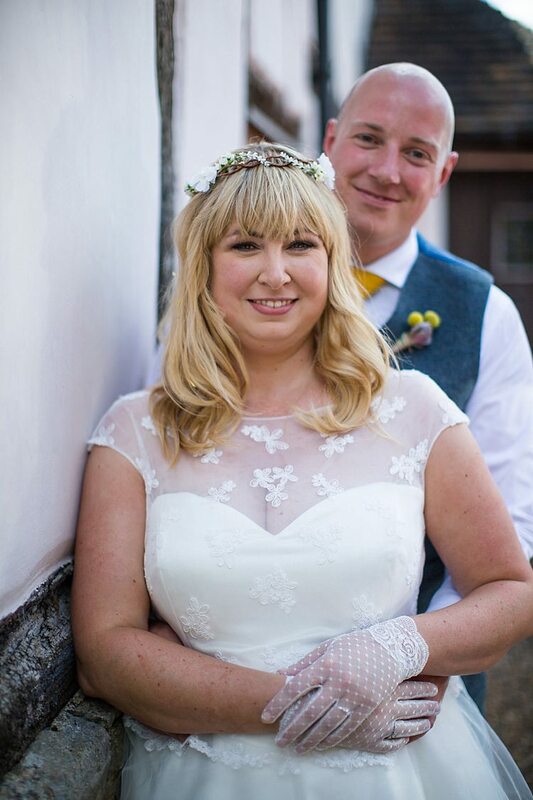 I bought my dress from Belle en Blanc in Olney, Buckinghamshire. Karen who owns the shop was a truly lovely lady, offering me lots of sound advice, and giving a very ‘dress-shy tomboy’ confidence that I could be a beautiful bride. 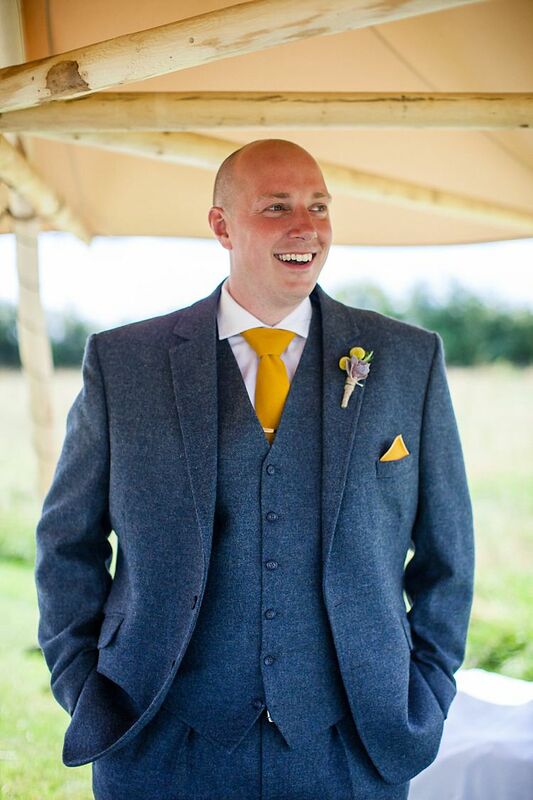 GROOM’S ATTIRE | Paul had always wanted a custom made suit, and so we had a blue herringbone tweed suit made by a tailor local to us in Headingley, Leeds. He was a little warm in the August sunshine, but having a 3 piece meant he could shed his jacket and still look smart in the waistcoat. 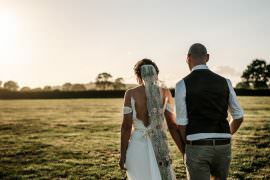 THE READINGS & MUSIC | Paul and I had technically got married the day before at the local registry office, and so a celebrant came out to perform a ceremony in the field. 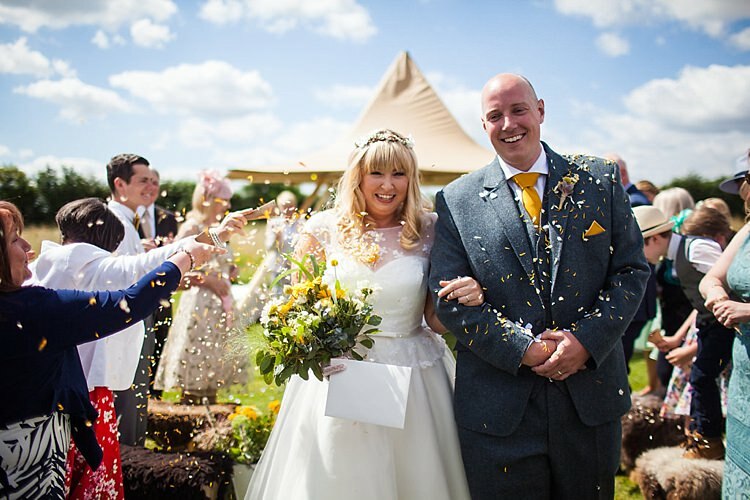 We chose Bernadette French, who is a true professional and was crucial in planning the intricate details of a DIY outdoor ceremony, she offered so much helpful advice on so much more than just the ceremony. My sister Kimberley read the “Desiderata of Happiness” by Max Ehrmann, as it always meant a lot to my mum’s mum and is a beautiful non-religious reading. Bernadette read “The Future” by Emma Salmon, as we felt it was just ‘us’ through and through (and some of our guests thought so too). 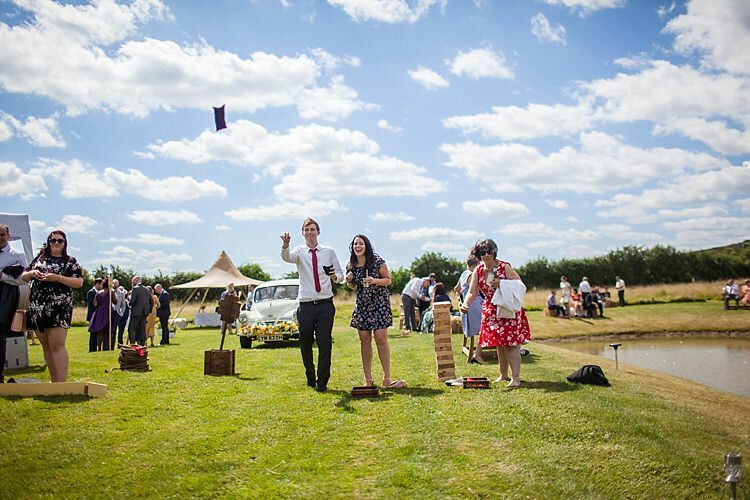 Whilst our guests were arriving we played a mixture of 50s do-wop music, which was great easy listening, and really set the scene as I was to arrive in the meadow in my grandmother’s vintage white Morris Minor. 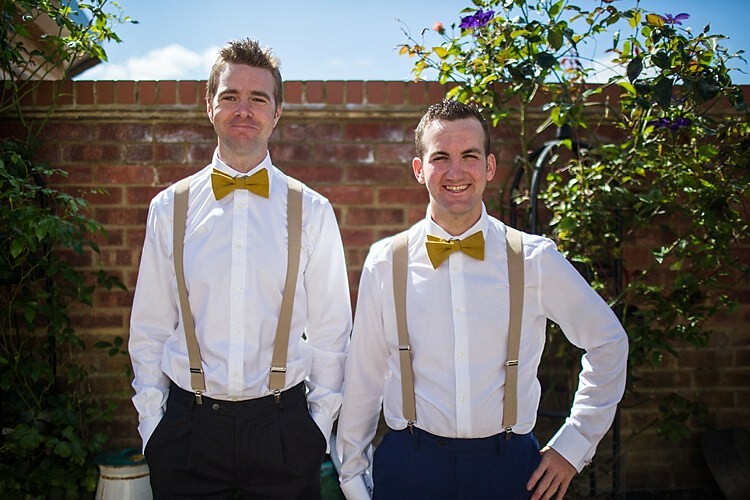 I walked down the aisle to Ben E King’s “Stand by Me” (Paul’s favourite song) and during the signing of the register we played Doris Day’s “Que Sera Sera”, and Louis Armstrong’s “What a Wonderful World”. We finished the ceremony with Andy William’s “Happy Heart”. 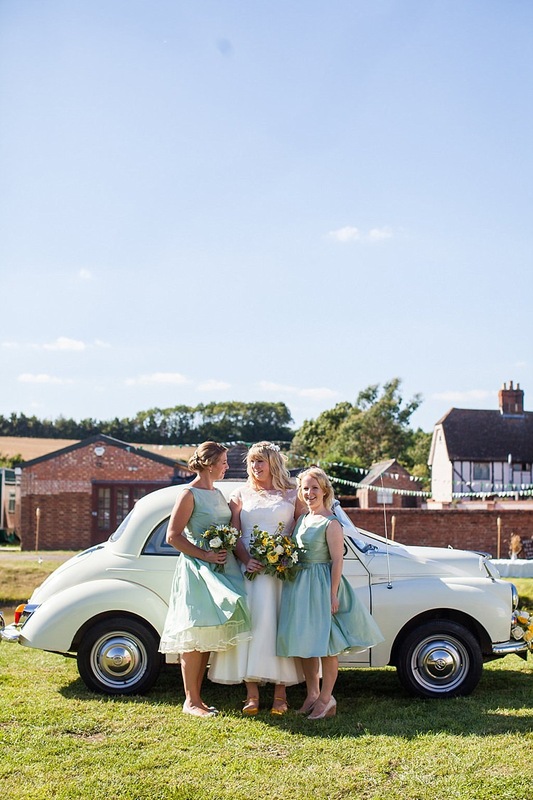 BEAUTIFUL BRIDESMAIDS | Our two bridesmaids, my sister and my best friend, wore 50s style dresses in sage green taffeta with cream petticoats, from Honeypie Boutique. They both had champagne gold shoes, and had loosely curled hair either up or down. I love looking at photos of the bridesmaids, it brings a smile to my face every time, they just looked absolutely beautiful! 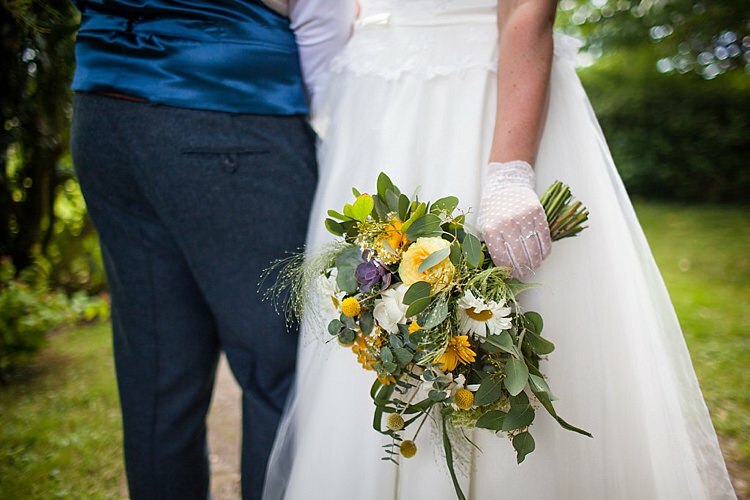 THE FLOWERS | The flowers were by Wild Orchid Designs in Leighton Buzzard, and for us were another very important key aspect of the wedding, as we are both keen gardeners and love fresh flowers. 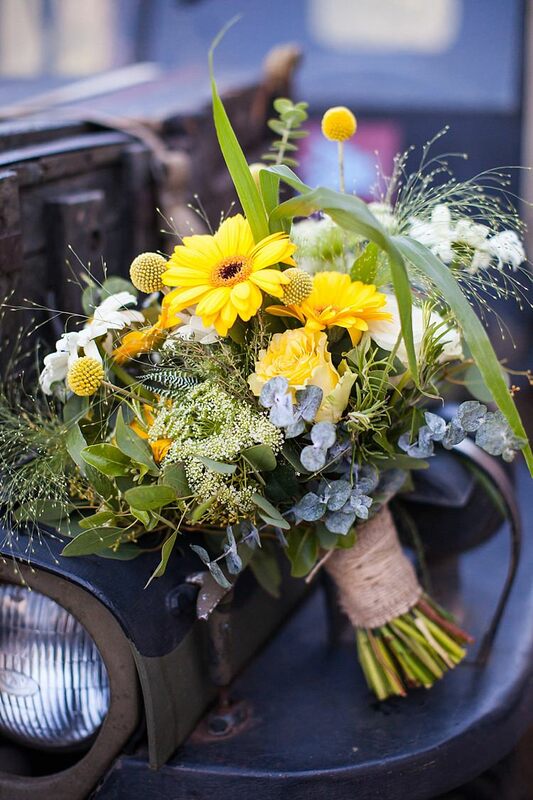 My favourite colour is yellow, and so Wild Orchid created arrangements that included some of our favourite flowers using a palette of yellow, white, and sage green in gerberas, white and yellow roses, matricaria daisy, craspedia, eucalyptus, succulents, and mixed herbs including sage and rosemary. 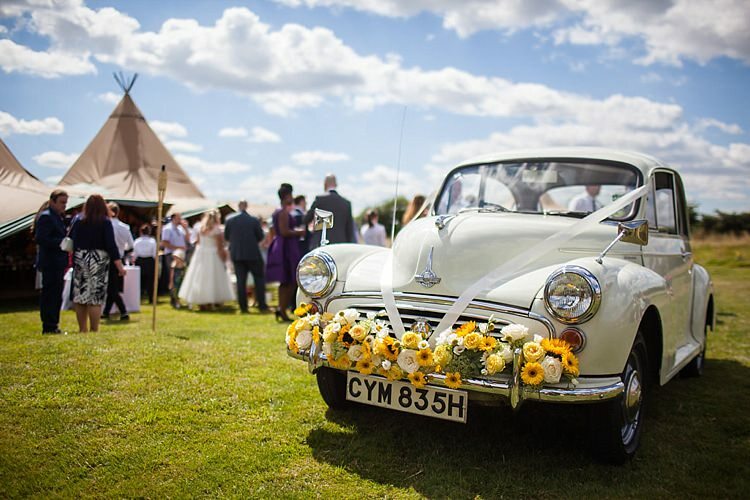 They also made arrangements to hang in the apex of the tipis and attach to the front of the Morris Minor. The flowers were stunning, I can’t praise them enough. My mother in law also filled lots of old enamel pots and jugs we had lying about with corn and flowers from my parent’s garden. 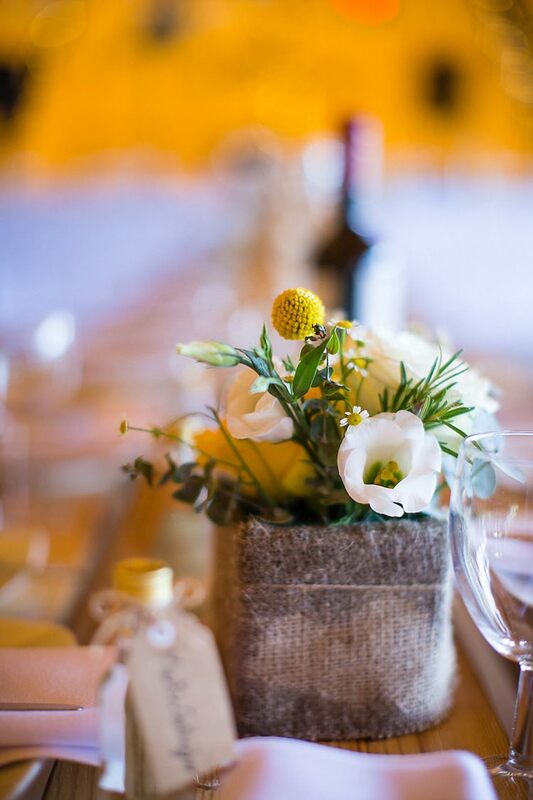 She did an astounding job as she just used what she could find around her, and we loved these arrangements just as much as the flowers from the florists. THE CAKE | The cake was a complete surprise put together by my mother and brother. We didn’t get to see it until the day! 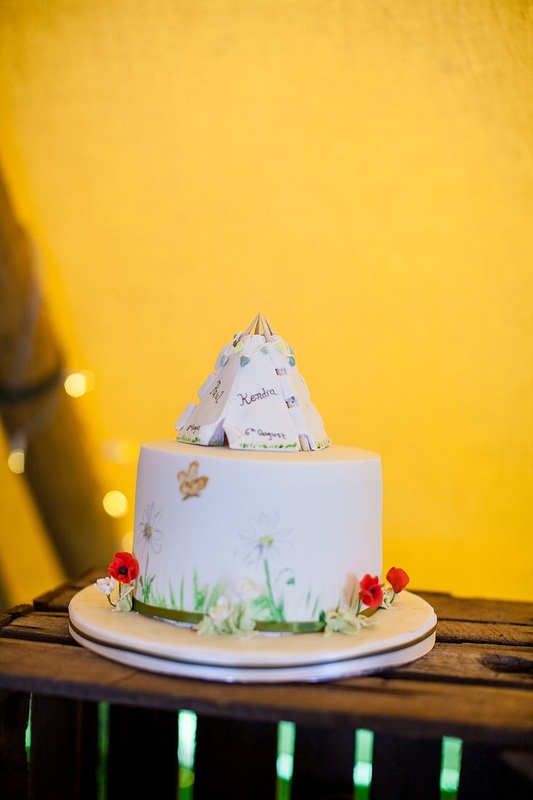 It was inspired by my love of beekeeping and wild mushroom foraging, with an icing replica of my 3D tipi wedding invitations on the top section. The cake was made by Rachel Maddams, it looked stunning and tasted superb. The sponges were champagne and strawberry, carrot cake, and then a fruit cake for the top – which we have saved and are going to eat this Christmas. The cake was set up on a display of old crates with candles and garden flowers and arranged by my mum. 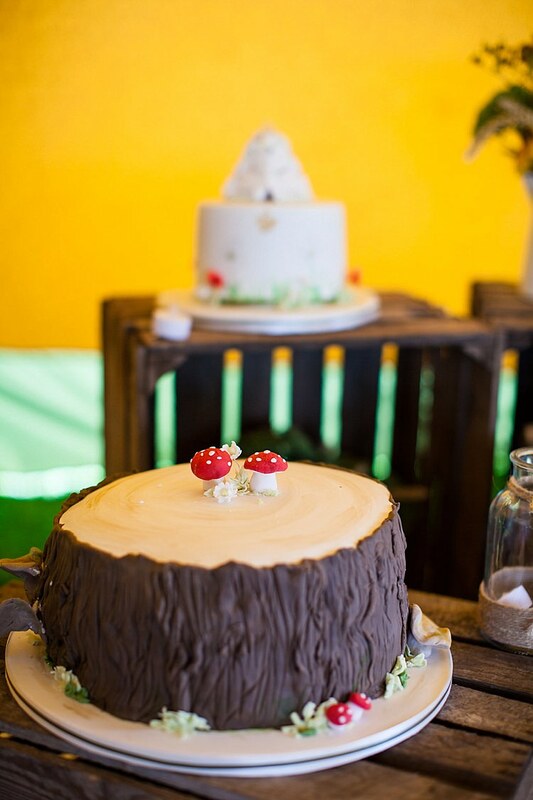 Don’t let anyone tell you different – people just love cake at a wedding. 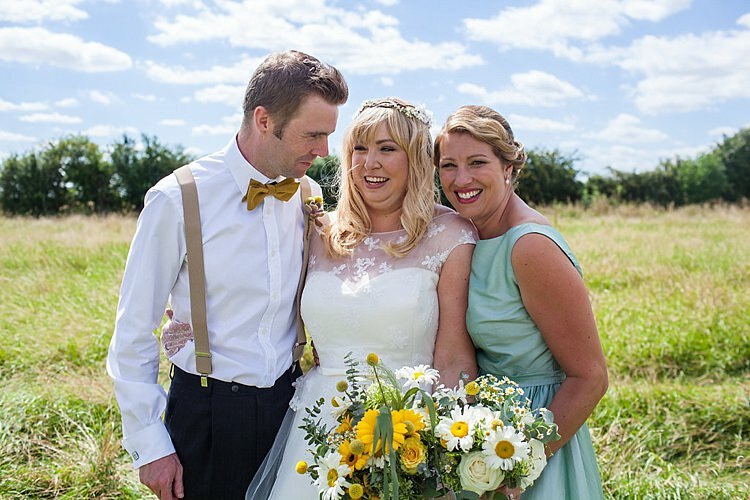 YOUR PHOTOGRAPHER | Sally Forder at Binky Nixon Photography. What can I say about Sally… well we had found ourselves a little gem! Sally was a huge part of the wedding, not only taking photos, but helping parts of the day come together, and even calming the nerves of a very anxious bride. We had lots of lovely comments about the “canny lass” with the camera, and it was great to work with such a bubbly and charming professional. 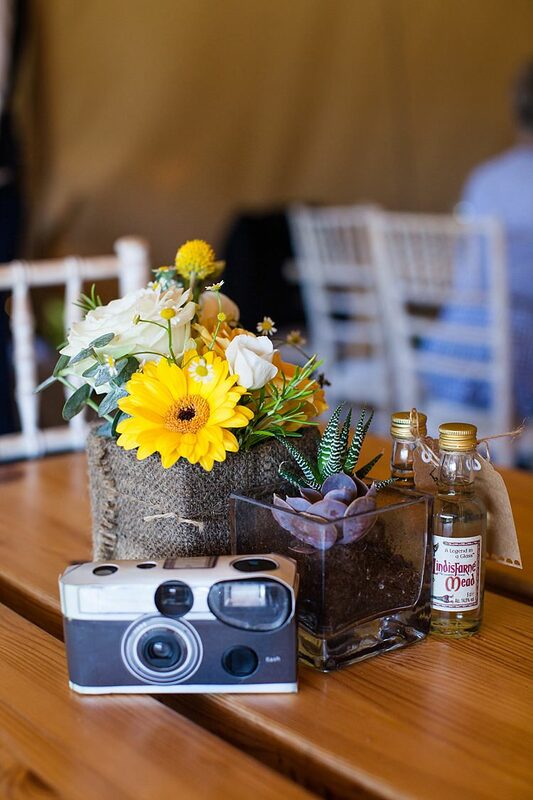 THE DETAILS & DÉCOR | I loved bringing all the details of our wedding together and all members of the family pitched in and put in a lot of work, but it was incredibly rewarding as our guests really seemed to appreciate it. 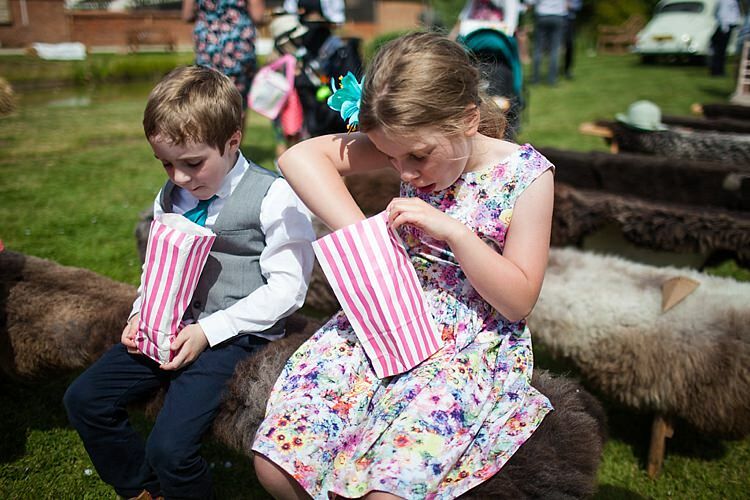 Whilst our guests were arriving the ushers handed out small packets of natural flower petal confetti. It was quite pricey, but definitely worth it for that fabulous confetti throwing shot! 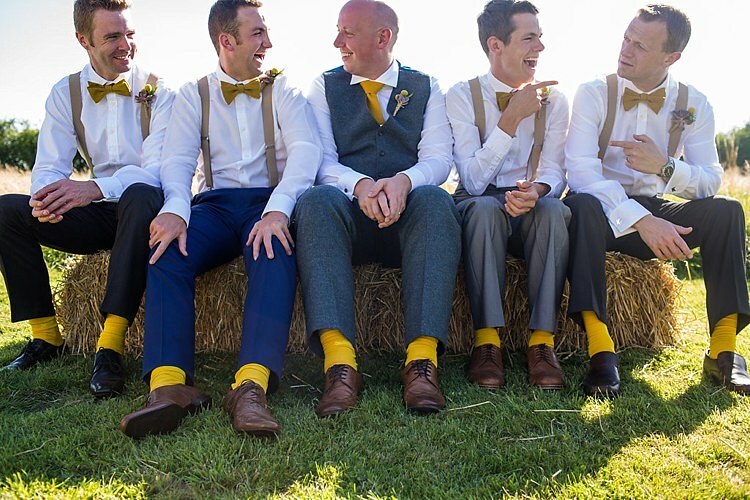 Our ushers were provided with braces, mustard yellow bowties, and yellow socks. 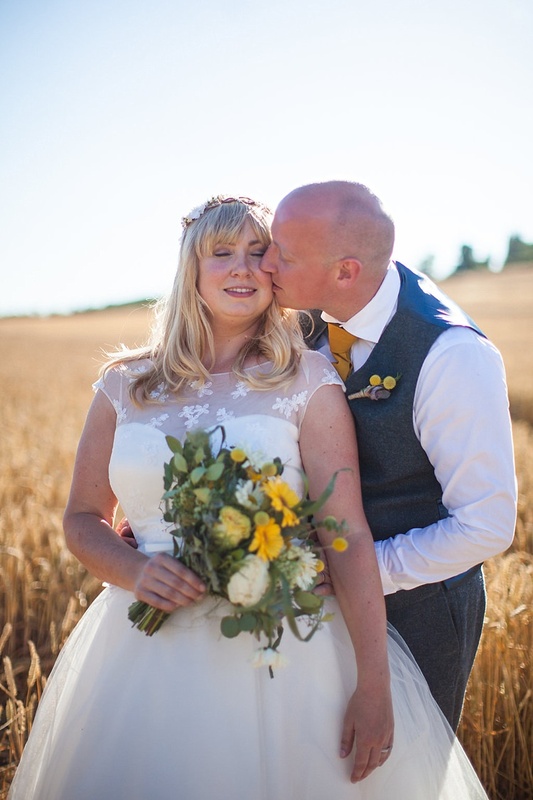 It was such a hot day that they shed their jackets, but their buttonholes just looked fantastic fastened to their braces instead. 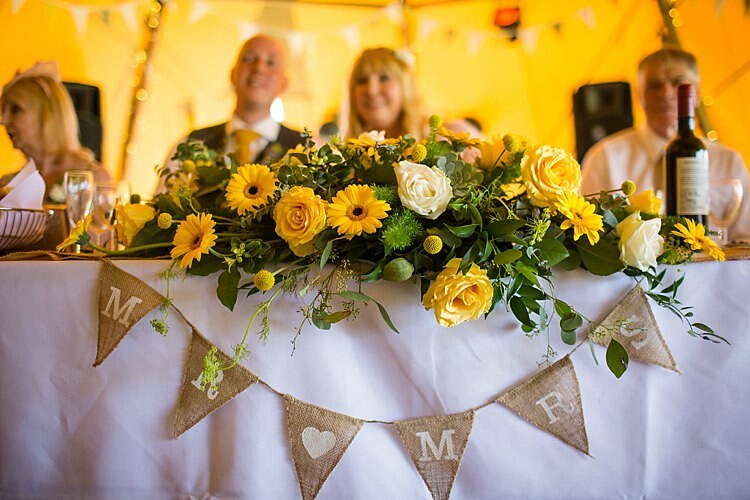 The bunting was handmade by my mum in our chosen colours of yellow, sage green and white. She did a beautiful job and even embellished all the fabric points with little crystal beads! I also hung tea light baubles in random clusters around the tipis. 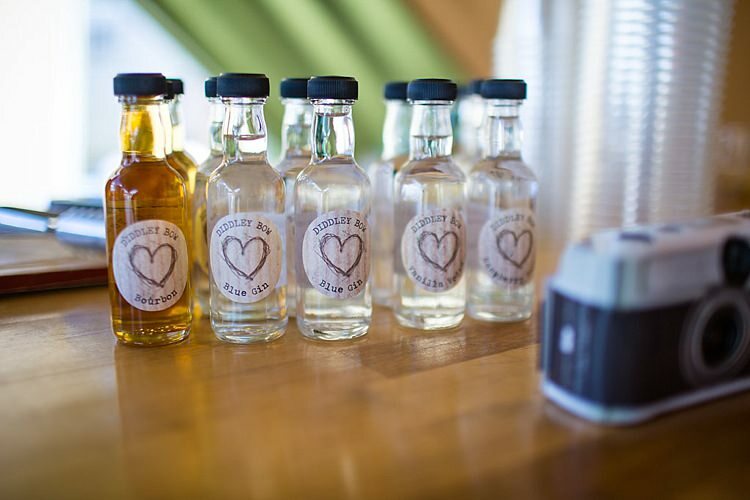 Our table favours were miniature bottles of Lindisfarne mead, which was my nod to the coming together with Paul’s family whom all hail from the Northeast. We also put out some toys, puzzles, and colouring-in favours for the little ones amongst the guests. Disposable cameras were also dotted around to try and capture a few crazy moments that would otherwise be missed. 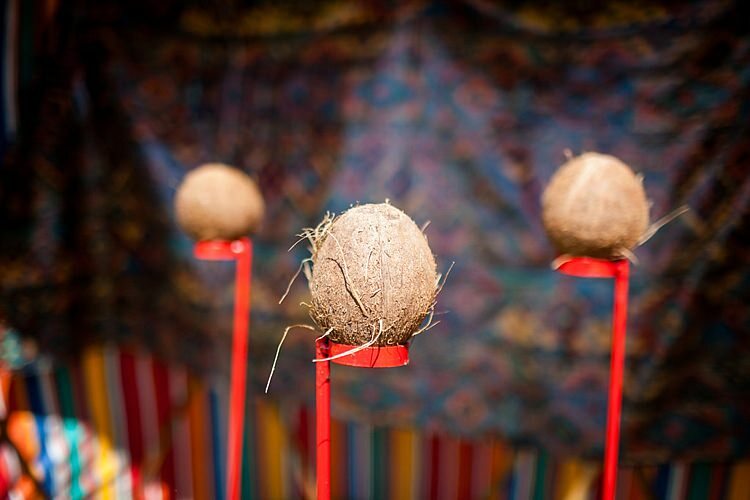 We had a selection of vintage games and a coconut shy which always seemed to be in use throughout the day, and a tug-of-war rope was put out resulting in some very funny moments later in the day! 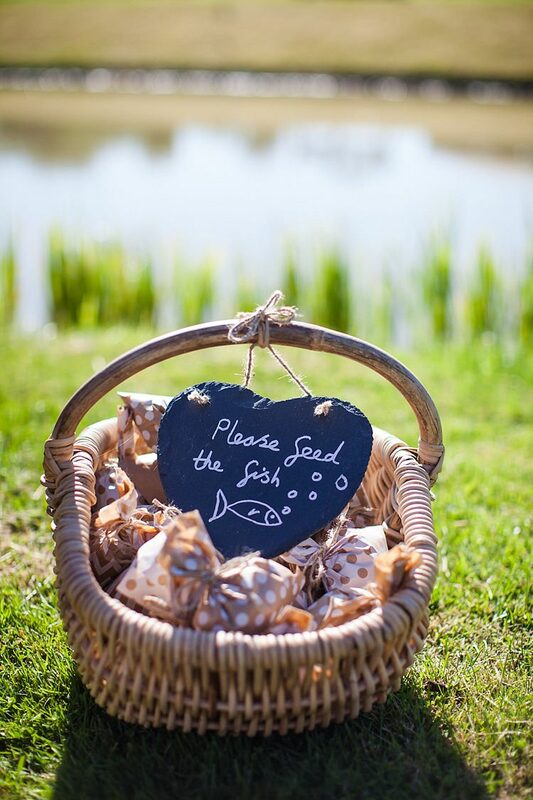 I also put out a basket containing packets of fish food, so guests could sit on the straw bales around the pond and feed the fish. My mum had ordered a sweetie cart as a surprise, and it went down exceedingly well with barely a sweet left in it by the end of the night. 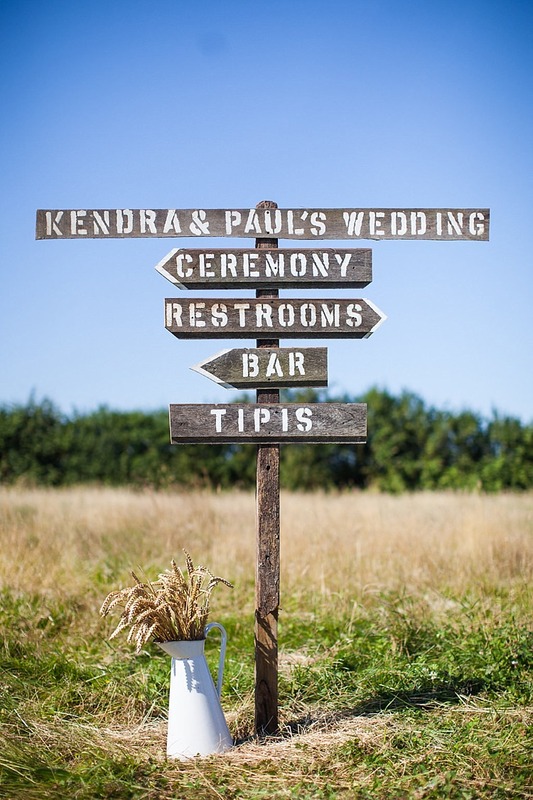 The rustic wooden signage was made by my brother using scrap wood and stencils, they looked really effective and we loved them! The blanket basket we provided was also used when it got a little chilly at night, and we also put out a huge pot of marshmallows and toasting forks for guests sitting around the fire pits. But I think despite all the details we had put in ourselves, the favoured wedding accessory had to be Duke the cat! Who is always mooching around the farmyard and just loves people, we had provided him with his own bow-tie as it was inevitable he was going to be mingling with our guests as much as us! 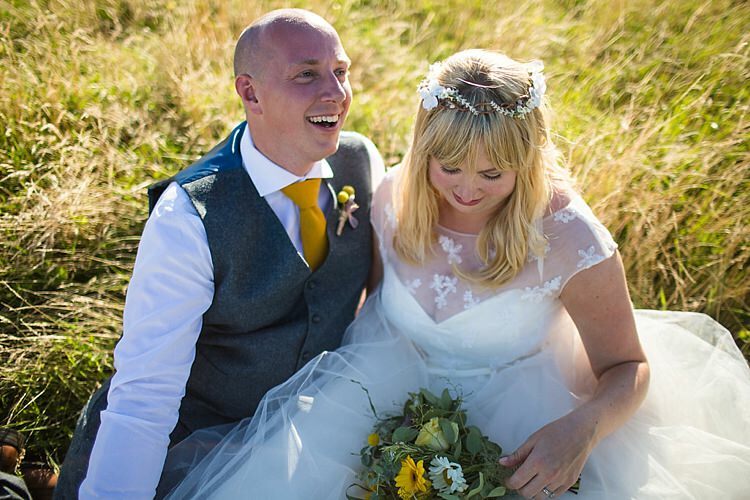 THE HONEYMOON | Our honeymoon was a cottage retreat in the Peak District. When it comes to holidaying we really just enjoy the simple things. 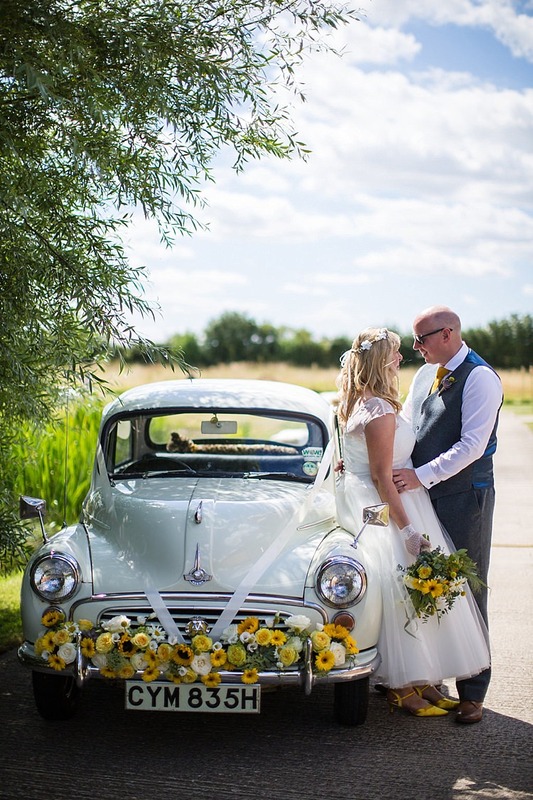 MEMORABLE MOMENTS | My dad driving myself and my bridesmaids out in my grandmother’s Morris Minor, it was a magical moment as the car just held so much meaning for my family. I had been anxious all morning but as soon as we drove out into the field and I saw Paul standing there with all the people whom we loved most in the world, I just completely relaxed and started to soak in every moment. 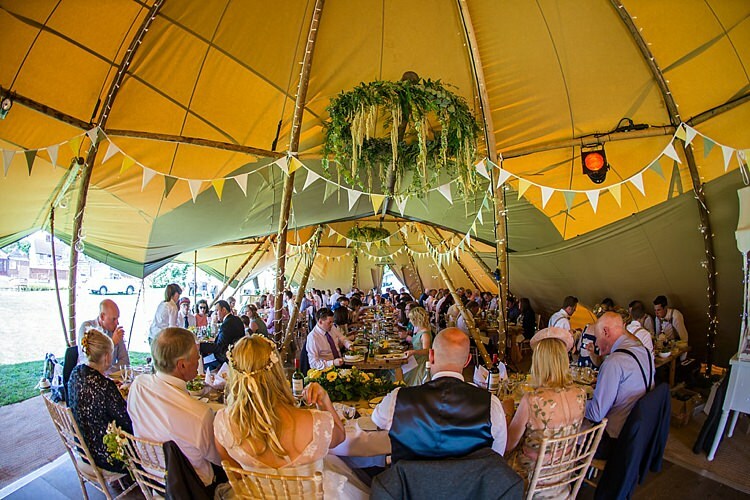 Looking down the tipis from the top table and seeing all our favourite people there because of us, with smiles on their faces and enjoying the food and wine! The girls versus boys tug of war, obviously the girls won! The fireworks display put on by my brother-in-law, was just a fabulous crescendo to our dreamy day. 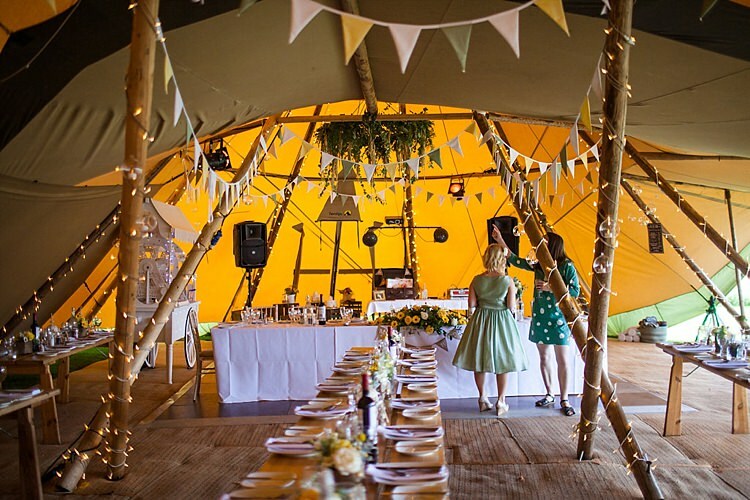 ADVICE FOR OTHER COUPLES | I was pretty overwhelmed by the task of organising a DIY wedding, and it was a lot of work, but once the big aspects are booked in it will all start to come together… How do you eat an elephant? A little bit at a time!! 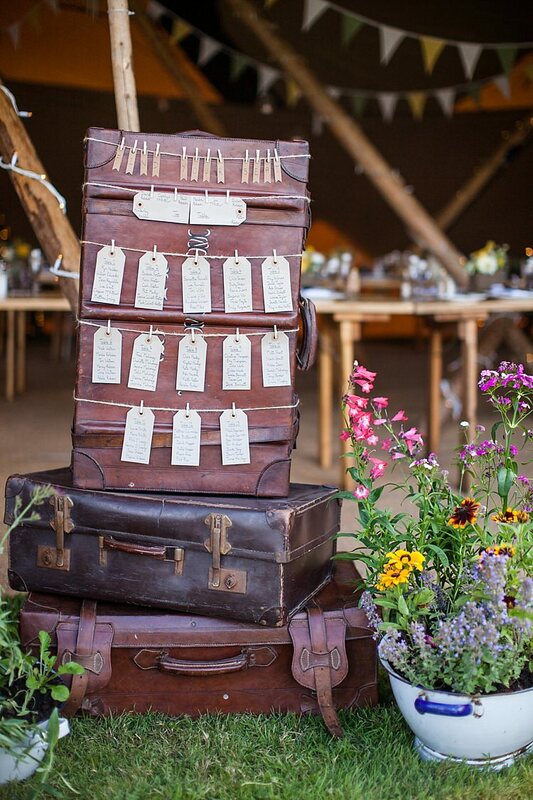 The things that live with you after the wedding are the rings and the photographs. Try and find a photographer that suits your style. 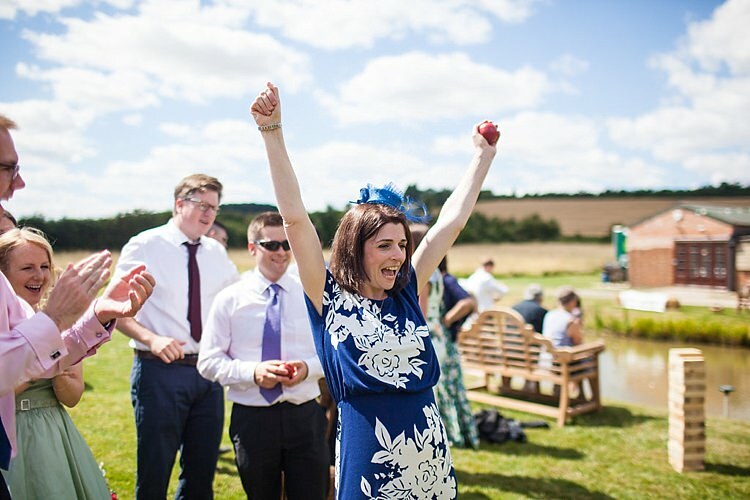 Formal photographs have their place, but some of the best photos are the informal ones of your guests relaxing and having fun at your wedding. 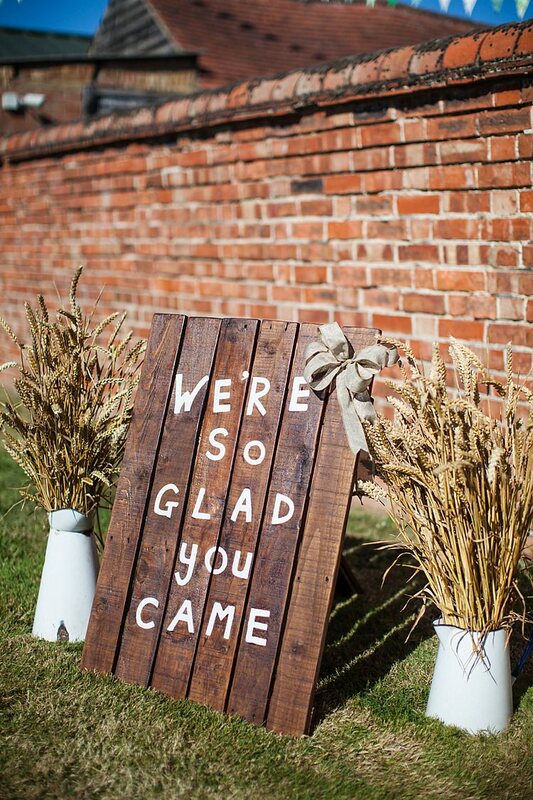 If you are having an outdoor wedding, invest in some ‘posh portable loos’ your guests will really appreciate it. Feed your evening guests well, they are always hungry! And Pinterest is your best friend. Above all work out what is important to you, and don’t worry if all the details aren’t perfect. 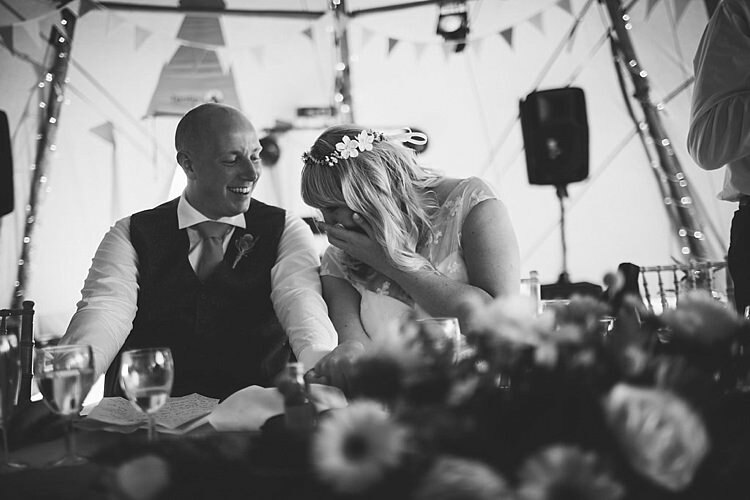 The perfect bit is being surrounded by all your most treasured people, and marrying the person whom you love the most! 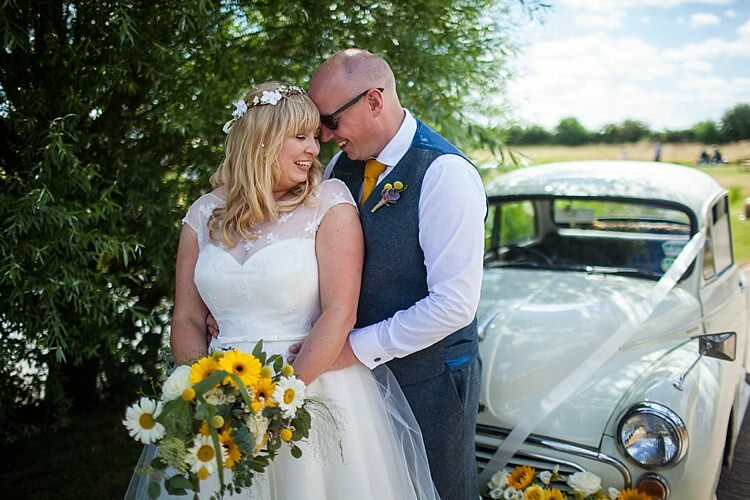 What a cracking set of photo’s Sally, with a lovely couple with such considered styling and great weather. 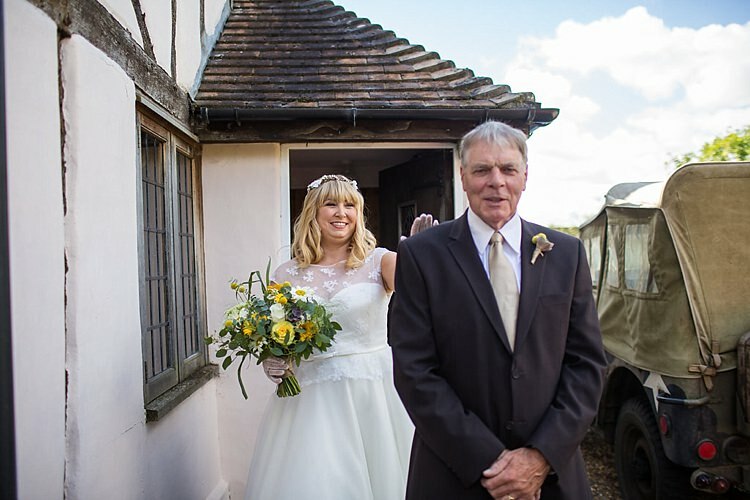 So pleased as a company to have been able to work with you on this wonderful wedding.